It seems it is an annual thing for whisky lovers in NYC to hire the biggest and most luxurious boat they can get their hands on, load it up with finest food and whisky, whisky ambassadors, distillery managers and master blenders and then cruise around at night allowing those lucky few who purchased their tickets in time to have a blast they would never forget. The event is organised by Whisky Guild and it’s called Whisky on the Hudson. There are still a few tickets available for this year’s cruise taking place on August the 26th. What’s more, we got wind that this year during the event our old pal, Sam Simmons from Balvenie, will be hosting a brand new baby of his – “Balvenie Experience Room”, which is in simple words a rather lavish tasting in a super cushy environment designed to make you melt from all the goodness and comfort. The whisky line-up is impressive and includes some historic, exclusive, rare and yet-to-be released Balvenies. Now, I won’t be able to attend but I know some of you guys read us from New York and I think it would be a shame to miss it. One more thing. 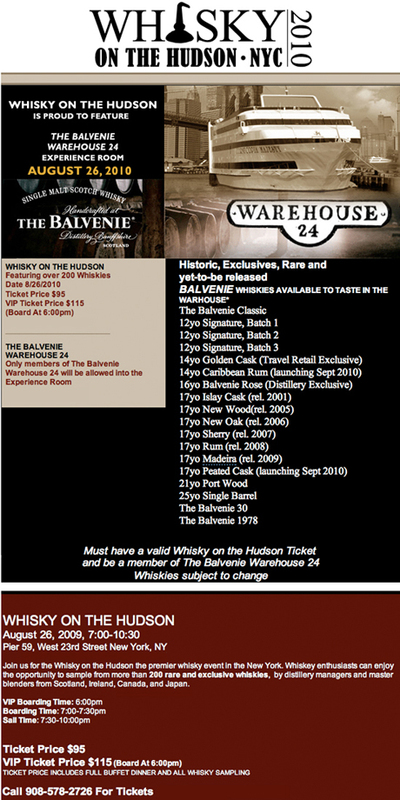 To participate in Sam’s tasting you have to be a member of the Balvenie Warehouse 24. I think this is a good opportunity to encourage those of you who haven’t got a Balvenie Warehouse 24 account to get one (even if you’re nowhere near NYC on the 26th) and check their Whisky Shelf options out. Chris and I had some issues with the website in the past but it has greatly improved and we think it is worth your while now. If you want we can do a bigger piece on it, explain how it works… but I think it’s way easier if you just click your way through it for a few minutes. Whisky on the Hudson NYC poster and Sam’s full line-up below! This entry was posted	on Sunday, August 1st, 2010 at 9:18 am	and is filed under Events. You can follow any responses to this entry through the RSS 2.0 feed. Responses are currently closed, but you can trackback from your own site.